Would you like to stay at a working windmill? Our windmill and granary were built in 1819. 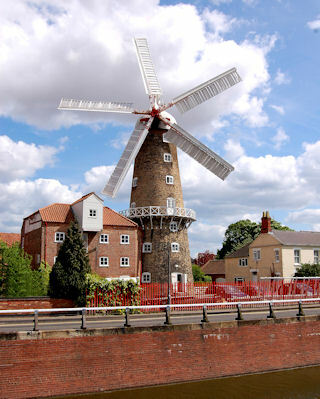 Having restored the windmill in 1987 we did the same to the granary in 1989, the planning consent allowing residential use for the parts no longer required for the mill. We are happy to announce that following a complete refurbishment you can now stay in our lovely old building with your head against the curved wall of the windmill whilst you sleep! Boston is well placed for touring and locally there is one of the best markets in Lincolnshire held every Wednesday and Saturday as well as many good local shops for provisions etc. For days out the Lincolnshire Wolds are 15 miles away and market towns such as Horncastle and Louth are an easy drive. North Norfolk is about 30 miles and Hemswell with its massive Antiques Centre about 50 miles. Skegness is 20 miles and our nearest seaside. The RSPB bird sanctuaries at Freiston Shore and Frampton Marsh about 5 miles away. 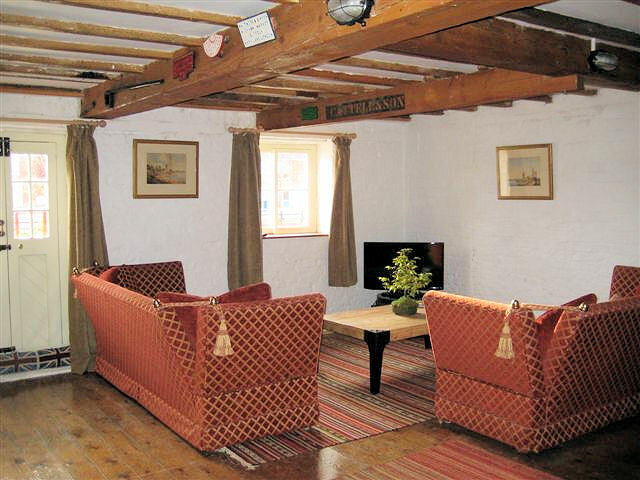 The Granary is arranged for two adults and has a king size brass bed, roomy living space with two sofas to spread out on, a digital tv and Blu-ray player (which plays most dvds too). Free WiFi is available. The floors are varnished pine with rugs for extra comfort. 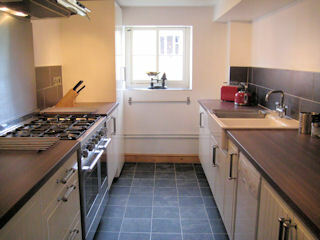 A newly fitted kitchen with range cooker, dishwasher, microwave oven, fridge freezer and toaster. Bathroom with roll top bath and a spray shower over it with a separate lavatory. We do not believe in filling the place with gewgaws but you will find a few interesting paintings of local windmills as well as a few mill relics scattered about. There is a selection of things to read and boxed games to play. The flat is on the first floor up one flight of gentle stairs. The owners, James and Richard, live on site and are more than happy to help you with directions for shopping, eating or outings. A free visit to the windmill is also on the cards! Remember. Part of the fun staying here is that it is a working windmill so there will be unavoidable rumblings from the machinery during daytime working hours! There is free private parking at the Mill. Satnav postcode PE21 9EG, 16 Willoughby Road, Boston. The holiday flat comes with some basic groceries to save you the trouble when you arrive. There will be tea, coffee, sugar, cooking oil, salt, pepper, a loaf of bread made with our flour, bag of our porridge, jam and marmalade, tomato ketchup, milk, butter and biscuits. 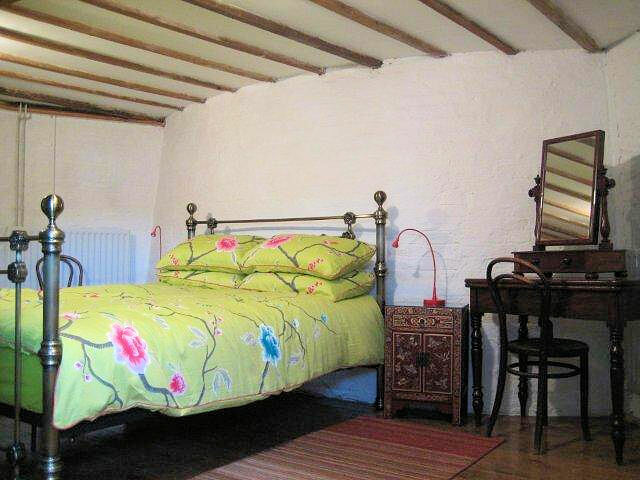 The beds are made up with fresh linen and towels are provided. Heating is by central heating in cool weather and electric fire in the summer. All these are included in the price so there are no extras to bother about. The Maud Foster Mill is situated close to Boston Town Centre and an easy walk for pubs, restaurants and shops so no worries about enjoying a drink with your meal if you decide not to cook! The restaurants are many and varied from local pubs to Indian, Italian, Chinese and Polish venues. The local delicacy is the Boston Sausage! Sorry, no children or pets and as we are a food premises smoking anywhere in the building or on site is not allowed. If you would like to check availability and prices please check with the booking agent holidaycottages.co.uk where the property is listed as the 'The Flour Mill'.